A dangerous blaze near Laguna Terrace Park in September 2012 sparked buy power lines was smothered in a few hours due to low wind conditions. Laguna Beach Mayor Bob Whalen and Southern California Edison President Pedro J. Pizarro met face-to-face last week to discuss the public-safety risk of the utility’s above-ground power lines and to press for a plan to remove them citywide. “We had a very good opening conversation to discuss how we could collaboratively address the ‘undergrounding’ of the entire city,” said Whalen, who was accompanied at the meeting Friday, Aug. 28, by City Manager John Pietig, Councilmember Rob Zur Schmiede, Fire Chief Jeff LaTendresse and Public Works Director Steve May. 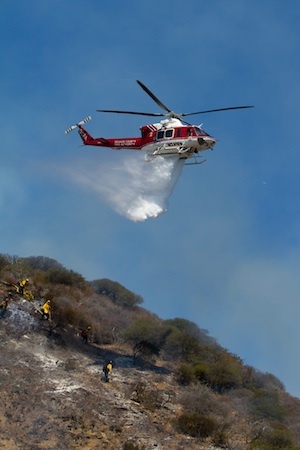 A water-dropping helicopter maneuvered within yards of hot spots, drenching flames with precision near Laguna Terrace Park on Sept. 20, 2012. During the meeting, city representatives presented a few proposals to Pizarro for review. In an interview Tuesday, Whalen said SCE officials agreed to study the options and reconvene in a month. “They will come back with alternatives and possibly other options, but it was a good first meeting and we are trying to find common ground,” said Whalen. Cost and safety are the primary issues on the table from the city’s perspective. 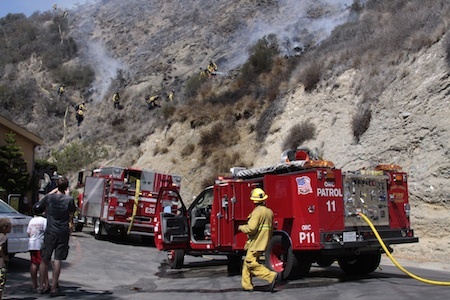 In July, after SCE equipment sparked a blaze in Laguna Canyon that set residents on edge, Whalen issued a statement calling the utility’s above ground lines a hazard. “We can no longer risk a major fire disaster caused by power lines, it is only a matter of time,” he said. Whalen said he reiterated those comments at the meeting, pointing out that four fires within city limits had been traced back to SCE power lines over the last eight years. As for cost, city representatives were looking for SCE to carry more of the financial weight of the “undergrounding” process, undertaken largely in piecemeal projects in neighborhoods that often take years and underwritten by assessments of individual property owners. “We no longer want to take an incremental approach and do a six year at a time neighborhood change. Our plan is to take a city wide approach, and we let SCE know that there are economies of scale and more efficiency in this plan,” said Whalen. Just 40 percent of the town’s 10,900 electric meters are below ground, a staff report says. Some work is paid by utilities with funds required by the California Public Utilities Commission and the rest is paid by individual property owners. Over the past 25 years, 22 neighborhood assessment districts, comprising 2,200 properties, were created to underground their utilities, costing property owners about $45 million in current year dollars, Public Works Director Steve May said in a March 2014 report.